Mixed media wearable art,handmade in Wales. Hi,my name is Anne,I am a beadaholique.I work out of my studio in the beautiful Brecon Beacons National Park.My work is mainly mixed media with some steampunk elements thrown in for fun.I was a finalist in Beads and Beyonds"Jewelry Maker of the Year 2010" I won first prize in Smitten Beads Designer Challenge 2011. I have had my work published in various magazines and in several treasuries,online.I have two Etsy shops and a Folksy shop for my clients who do not wish to shop in US $,but prefer sterling.Feel free to look me up on twitter or Facebook.Cheers,Anne..
Take a look at my Etsy shops by clicking the links below. This year I am able to participate in the Bead Soup Blog Hop. I swopped beads with Nikki Sargeant Meiners. She sent me the most fabulous selection of vintage beads in luscious colors. I am doing my reveal earlier than planned as going on a cruise tomorrow so will not be here for the blog hop. I will catch up with everybody's blog posts when I return. The first picture is my glorious soup. I have had not had as much time as I would have liked to work on my soup. I will probably do something fab with the rose,the buttons and the stunning yellow beads when I return from my break. Some of the beads that I added are repurposed and the metal components are embossed copper that I have been experimenting with. I hope you enjoy and don't mind too much that I am revealing all a little early. It has been some time since my last blog posting. I have been busy moving house,building my new Etsy supplies store and decking the garden. Also have built and installed a new kitchen and set up my new studio. I admit that I have had a little prod to get me going. 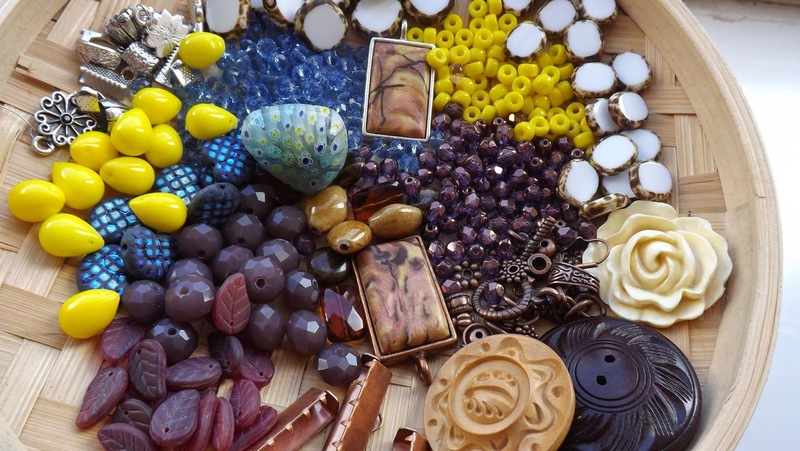 There are not enough hours in the day for everything but have decided to join Lori MacDaniel Anderson's bead hoarders blog hop. That means that I have have had to learn to cut and paste etc. If eventually I can get the link to work,it will be all systems go. The summer weather is continuing for longer than anticipated and it has been a week of barbeques and garden parties here at Chez Anne.Girls have had a couple of house parties this week and my garden is looking worse for wear as a result.Also all the sleeping bags etc have been left in my poor studio as if it wasn't suffering enough already with me reorganising. it! Signed up to resume my Humanities degree course starting October, the Art History course. Got butterflies as a result as not studied formally for about two to three years. Really excited about it! At least this section will be in English as the European humanities module last time was through the medium of French. I have to say that did stretch me a bit as my French was "schoolgirl" and a little rusty however achieved a couple of straight "A"s on the course which was huge surprise. Steampunk Fair in Cardiff will be a blast in August as not something that I have done before so really looking forward to that. There are going to fundraising activites for Help For Heroes on both days and some very interesting entertainment as well. Look at the page on Facebook for some ideas and information. The fair has been set for the fourth and fifth f August at the Owain Glyndwr pub just off the Hayes. There are some excellent restaurants and bars nearby so will be great. I am hoping to take a couple of "glamorous" assistants along so I can go and have a bit of fun and do some networking at the same time! Trying to improve my range of contacts etc at the moment as I think woefully inadequate. I will be posting regularly from now on and am very pleased to say my followers are on the up, more than twenty on here and about one hundred and forty on Etsy. I am still surprised that anyone would be interested in my random ramblings but here we are. Love and light to you all,Anne. Firstly I must apologise for the lack of blog updates recently. Some of you will be aware as to the upheaval of the last year and my move of studio into town. Unfortunately this has turned out to an unmitigated disaster which has cost a great deal financially and emotionally. I am in the process of re-establishing my studio at home and am trying to concentrate on competition pieces,commissions and relaunching on Etsy. I listed a couple of new items this week and strangely found myself feeling very fragile as a result. However,difficult as things have been, I am glad I tried as you never know until you do something.Risk taking comes with the territory. I have found some time to go on holiday this spring and visited Rome again,walked the Monaco Grand Prix circuit as it was being set up. Best bit was Barcelona, we visited the Picasso museum in the Gothic Quarter and spent many hours wandering through the rooms there.Loved every minute. The only downside is never enough time to take everything in. I have picked up a paintbrush for the first time since I left off teaching art and am rediscovering the enjoyment I get as a result.However not sure what direction that will take me.Wait and see. Attended The Affordable Art Fair in Bristol a couple of weeks ago and spent a couple of hours there but not nearly enough time as so much to see. Hundreds of works by dozens of artists and sculptors,all so very talented. They also had fab cake and coffee. If time will definitely try to attend the next one. I have been trying to reorganise my studio so that it looks at least vaguely tidy but with my youngest daughter finishing her art diploma and lack of space,it has been a bit of a challenge. I could really do with a studio four times the size but am sure that I would still fill it with stuff! And now there are easels in the middle of the floor it looks even smaller. I will endeavour to improve it and will post pictures when I have done this. Have received an invitation to appear at the Cardiff Steampunk Fair in August so working on designs for that. I am also building up stock of unusual items for collage,steampunk and assemblage art. These will be available at the steampunk fair and on Etsy. I am also sourcing unusual items for clients. If looking for anything unusual or whacky,do not be afraid to ask. Just inbox me on Facebook,Twitter or Etsy. Enough of my random ramblings and I promise not to leave it so long next time. Light and love to you all,Anne. I have been looking at blogs by other artists this afternoon. Too many to name but words can never describe the unbelievable wealth of talent out there in " cyber world". Stitchers, jewellery designers, bead makers, glass artists! You name it! They never cease to amaze me. I wish that I was half as good at what I do. I wish that my blog was bigger, better, more colorful etc. I am not in the least envious, but in awe! I , however, endeavour to be inspired by my fellow artists and be better at my designs, to stand out more, to be better at my marketing and branding. Learn HTML so I do not always need help from my daughter's if I want to post links etc!!! I am rather pathetic when it comes to social media. I get by on luck, rather than skill and judgement and have learned a little to play with my computer as I now know that it will not explode or do something equally grotesque if I press the wrong key! I know there are a lot of people out there who feel that way about technology but usually they only open a couple of e-mails in work. They do not operate a plethora of Facebook pages for business and personal use,run blogs and Tweet and run online shops as well as a Flickr photostream! I sometimes wonder how on earth I ended up doing all these things! A few years ago, I didn't even have an e-mail address!!! What on earth happened??? The jewellery happened! I suppose "necessity is the mother of invention" and everything just followed from there. But I still can't get my head around how I arrived at this moment. Will let you know when I do. Dear friends and fellow bead freaks. I hope you all had a fantastic Christmas Day. I am feeling a tad delicate today as I over indulged in the Christmas spirit,so to speak!! Oodles of exciting things have been happening since I last put pen to paper(or paw to keyboard). I have moved my studio but in spite of my valiant attempts at being organised,it looks as much of a tip as before. However lots of exciting new designs in the pipeline for 2012 and I successfully completed my first ever craft show with lots more planned for 2012 as well. My work is also now available at the Cynon Valley Museum. I am very excited about this but as you all know it doesn't take a lot to excite me. Especially where beads etc are concerned. I am working on some altered art tile designs and a fab set for my craft shows. A bit of a "WoW" factor as based on an all American theme,rustic but sophisticated!! Something new for the UK! I have also asked my partner-in-crime Debra to make some new beads and I am hoping we can come up with some fab color schemes for the New Year. Watch this space as have a renewed sense of purpose! I have also had new Moos printed and looking forward to my new branding and image. A new range of boxes and tags are under design as well. 2011 was a year of extreme change for me. Sometimes frightening but I think it was all for the best. I am a very different lady from the one I was last Christmas. I have also met a lovely new guy and I hope we can bring out the very best in each other. He is simply adorable and he even paints a little which is fantastic.